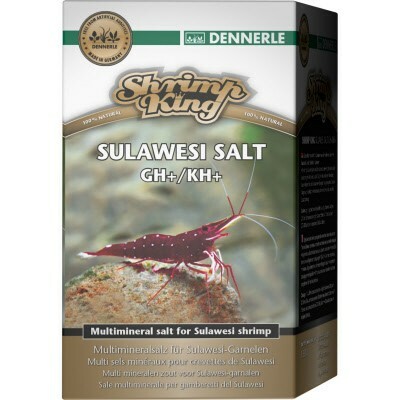 Dennerle Shrimp King Sulawesi Salt is just what you need for targeted hardening of osmosis water, rain water, and deionized water. This product was created for Sulawesi shrimp, especially the Caridina dennerli. Dennerle Shrimp Salt is comprised of all the key minerals, trace elements and vitamins shrimp require for healthy, steady growth, brilliant colors and successful reproduction. Sulawesi Salt works to alter total hardness and alkalinity in water to simulate what Sulawesi shrimp are accustomed to in their natural habitats. At the same time Sulawesi Salt improves the performance of filter bacteria and the growth of aquatic plants. It is quickly applied and immediately soluble.